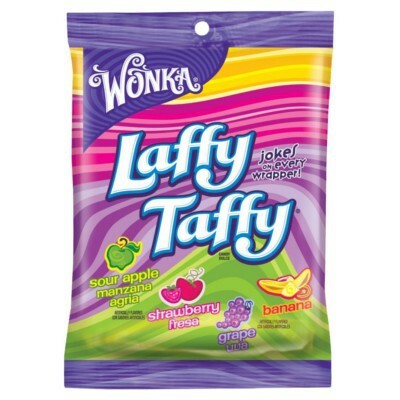 One of the best-known classic products by Nestlé-Wonka, Laffy Taffy is just as soft, fruity, tangy, and delicious as you remember! 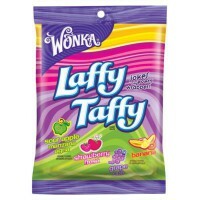 With jokes on every candy wrapper and no artificial flavors, these American taffies are a hit with sweets aficionados of any age. Flavors include strawberry, grape, banana, and sour apple. This bag contains around 16 fun-sized taffy candies, so you'll have no trouble sharing--and no trouble finishing the bag off yourself! Corn syrup, sugar, palm oil, less than 2% of: emulsifiers E471-E322 (soy lecithin), hydrogenated cottonseed oil, acidity regulator E296, salt, artificial flavors, colors E133-E129*-E102*. *May have an adverse effect on activity and attention in children. Contains GMO. Nutrition facts (for 100g): calories 359Kcal, total fat 5.1g (saturated fat 3.8g), total carbohydrate 76.9g (sugar 48.7g), protein 0g, salt 0.3g. Ressemble aux Air Heads mais meilleur. Je recommanderai. Caramelle buonissime, ottimi sapori, forse, un po' troppo appiccicose, ma restano pure sempre le migliori caramelle per me! Délicieux comme les Air Heads. J'ai adoré le goût et la texture, et mes enfants aussi.